The parents of a man killed in a fiery collision involving a Tesla Model S have recently filed a lawsuit in Broward County, Florida. An article detailing the lawsuit and the allegations is available here. The lawsuit, filed by the family of a deceased passenger in the vehicle, alleges that the manufacturer was negligent when it removed an electronic speed limiter from the car. It also suggests the battery Tesla supplied with the vehicle was defective. The 2014 Tesla Model S hit a wall at high speed on Fort Lauderdale’s Seabreeze Boulevard on May 8th, 2018 with the driver and a single passenger onboard. After rebounding, the vehicle then collided with a lamp post on the opposite side of the road. Both men inside were killed when the car burst into flames. According to the lawsuit, the family’s attorney claims the vehicle itself was defective and unreasonably dangerous. They suggest the car’s batteries were not shielded or adequately protected against the risk of fire during a crash. Two months prior to the crash, the parents of the driver had Tesla install a speed limiter after their son received a speeding ticket in the vehicle. The device limited the vehicle to a top speed of 85 MPH. According to the complaint, a Tesla service center in Broward County removed the limiter without the permission or knowledge of the owner while the car was in for service. 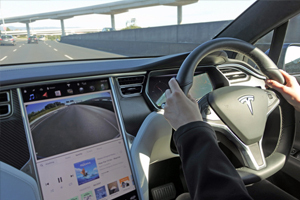 The passenger’s parents suggest Tesla was negligent to do so. The family’s attorneys allege the battery in the Tesla Model S is prone to catching fire, noting there have been more than a dozen worldwide incidents of Tesla Model S batteries catching fire during a collision. According to the National Fire Protection Association, fire departments in the United States have responded to an average 152,300 car fires each year between from 2006 and 2010.